See? No sooner do I finish moaning that I've got nothing to write about than I come up with a couple of things to share. First up: between the end of summer jobs and return to grad school, my girls closed their summer with a road trip through the southeastern United States. Ideally they would've taken a month, pointed their car east and toured the continent. However, since they and their former roommate Harminder only had 12 days, they flew into Kansas City and rented a car to drive to Memphis, down the Mississippi River to New Orleans, across to Orlando, then up the coast to Washington D.C. before flying home from Baltimore--99% places they'd never been. Luckily, they finished a week before Hurricane Irene arrived, and had a wonderful time. 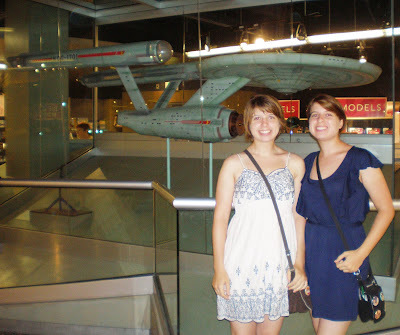 Which is all prelude to this picture my girls took just because they knew what a thrill it'd be for me: Robin and Laura with the USS Enterprise in the Smithsonian Museum's National Air and Space Museum. How cool is that? How cool are they? That's the actual 11-foot model used in the original "Star Trek" series. What a beauty! In my opinion, the Enterprise is the most iconic, convincing, well-designed fictional spacecraft in film or TV history, especially for its era (second best: the Eagle ships from "Space: 1999"). The old girl was in sad shape by the time the Smithsonian got her, and the quality of her restoration is controversial in rarified Trekkie circles. She's actually been restored a few times; the first was supervised by the ship's original designer Matt Jeffries and from what I've seen was well done. I think the museum's subsequent restorations were well-intentioned but ham-handed. In particular, the modelmaker hired to repaint it in 1991 went nuts with his airbrush, adding color, texture and seams absent in the original. The Enterprise had a deliberately smooth hull (Jeffries said he figured an interstellar vessel would be built so all its critical components could be accessed from the inside), and the lumpy-plated-weathered style of spaceship modelmaking didn't come into vogue until Kubrick's "2001" and especially "Star Wars." Still, I appreciate the photo a lot and must make this pilgrimage myself someday. I hear the Smithsonian has one or two other trinkets worth a look as well. Too much? Just remember, this is the kind of brain clutter that got my name in the acknowledgements of a "Star Trek" book, so go ahead and mock. No, really, go ahead. I deserve it. Second up: speaking of arrested development, a lot of people are posting the video below and I like it enough to do the same. It's an animator's re-creation of the old Jonny Quest cartoon's opening credits done in stop-motion animation. Key point: this isn't CGI, but actual models sculpted and shot against real backgrounds, all built by Roger Evans and his crew (although those photographic elements were then composed in Photoshop, making it partly CGI, I suppose). He worked on it over a couple of years. Even if you're not of a certain age that remembers Jonny Quest, I think you can appreciate the love and skill involved. And what great music! Third up: This is for my girls. Fifteen seconds previewing the upcoming second series of the BBC's modern take on Sherlock Holmes, which we very much enjoyed together. The 21st Century Holmes is an Asperger's candidate addicted to nicotine patches instead of cocaine who taps the Internet to supplement his formidable brain while Watson records their adventures for a blog. I guess Holmes and Watson survived last season's cliffhanger with Moriarty after all. Coming up: maybe "Hound of the Baskervilles?" Now I've got to get back to work. And, don't lie, so do you. Not literally. But I look at my blog's stats and see your repeat visits from cities whose names seem like familiar places to me. I don't have your IP addresses memorized, but give me time. So I feel bad when I know (but you don't) that there won't be any fresh content on the Fies Files today. I'm just very busy. Mostly with my science-writing day job, but also working on Mystery Projects X and Y (mostly Y lately). Something's gotta give. I also go through periodic moods when the Internet just seems like a giant sucking black hole that devours time and creative energy to very little purpose or benefit. No offense; I love you guys. Sometimes I just don't have anything to say. I also know from experience that my mood will lift and I'll soon be inspired to post something I just can't wait to share. Not much news. No word on Mystery Project X, but I didn't expect any yet. There's a good chance I'll be giving a workshop at the Alternative Press Expo (APE) October 1-2 in San Francisco. Details as they develop. I'm seeing a little uptick in sales of Mom's Cancer, due, I think, to a couple of universities requiring it in classes. There's another sentence I never would have imagined myself writing a few years ago. Note to any students out there writing papers: I am always happy to answer any questions but will not do your entire homework assignment for you. I hope all my friends and readers on the East Coast have working utilities and dry basements. It's going to be a sunny 85 degrees (29 degrees unAmerican) here in northern California today. You really should move here. Of course we have occasional earthquakes, but now so do you! You don't have that to lord over us anymore. Plus: no snow or hurricanes. Everybody be careful out there. Editor Charlie alerted me to a good interview at The Graphic Novel Reporter with Neil Egan, the talented Abrams designer who helped make Whatever Happened to the World of Tomorrow a better book than I imagined it could be. Neil notes that he and I were co-nominated for an Eisner Award for Best Publication Design, which was a thrill for both of us. And he's a great guy, which is always a plus. Although Neil and I worked closely by Internet and phone during the production of WHTTWOT, we didn't really sit down and talk in person until I made my way to New York long after the book had been published. Odd, isn't it? Creating a book can be an intense, intimate experience during which you really get to know someone you don't actually know at all. Can't argue with the results. Congratulations to my friend Neil for some well-earned recognition. I hope we get to work together again soon. 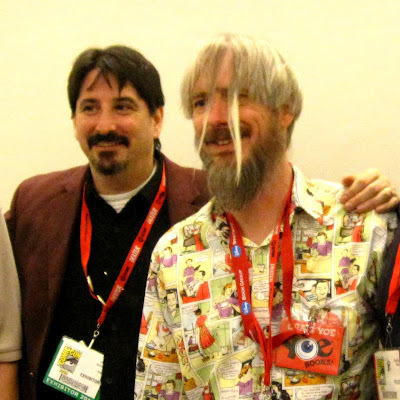 Surfing for an interesting photo of Neil, I found this of three men who contributed to WHTTWOT and one I've seen in his underwear. From right to left are my editor Charlie Kochman, designer Neil Egan, and photographer Geoff Spear, who shot the fine professional photos of the 1939 World's Fair pennant and Futurama pin that illustrate my book. 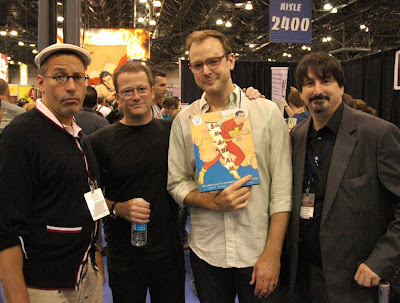 At left is celebrated designer/writer/editor Chip Kidd, who wrote the "Shazam!" book with which they all posed at the 2010 New York Comic-Con. Photo by Abrams's Chad Beckerman, stolen without permission. But we're all pals, right?. Go Team Cul de Sac! Rah Rah Rah de Rac! "The theme is going to be fun. It's your take on the Cul de Sac characters. Please run with them; deconstruct them, parody them, confuse them, cubisize them, psychoanalyze them, draw them in your own strip, whatever tickles your fancy. Enjoy. Open up your heart just create something out of the ordinary, maybe not your own characters, this is for you to let your talent to shine in a wide range of ways. Please write a little text if you would. Not necessarily about PD, but inspiration, technique, influences, determination, strength, spirituality, etc." So I did, and so did a lot of other people--maybe more than they expected. Many syndicated cartoonists such as Stephan Pastis, Mort Walker, Greg Evans, Jim Davis and Lynn Johnston donated pieces. "Calvin & Hobbes" creator Bill Watterson emerged from retirement to paint a picture for the cause. The deadline was several weeks ago, and Team Cul de Sac organizer Chris Sparks just shot a little video showing a conference room stuffed with submissions. I found mine at 1:25, right after Chris says, "and then there's more." There sure is! Maybe more than they can use; I wouldn't presume they'll all be in the book, and if mine doesn't make the cut that's fine. Maybe it'll raise a few bucks anyway. 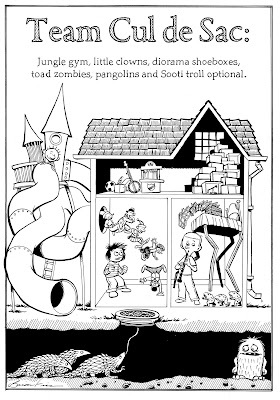 If you're not familiar with "Cul de Sac," which I believe is the best newspaper comic currently in print, the girl and boy inside the house are Alice and Petey, and the chaos around them invokes episodes and recurring themes from the strip. Pangolins, those scaly armadillo things which are Alice's favorite animal, are a lot of fun to draw! In fact the whole thing was a hoot, and I appreciated the opportunity to play in Richard's sandbox for a bit. I'll be sure to post information about the auction and book project as they come. Team Cul de Sac is good people working for a good cause and I'm proud to make a little contribution. Some blog posts are born when two entirely different things trigger the same part of my brain within a short span of time: a connection between ideas that don't obviously belong together. Yesterday, Karen and I saw the movie "The Help," based on a book she read and I didn't. Good film, I recommend it. It's about a community of black maids and the largely useless (but occassionally decent) white twits they serve, set in Mississippi during the Civil Rights days. Real-world milestones noted in the film include the deaths of Medgar Evers and JFK. When the movie was over and Karen and I were walking out to our car, we looked at each other with the same thought: "I can't believe we were alive when that happened." The further time carries us forward, the more the view behind becomes an unrecognizably alien landscape. With that thought still rattling uneasily around my brain, this morning my pal Mike Lynch posted a video that lit up the same neurons: a tutorial on How To Dial a Rotary Telephone. Granted, it was made to teach those at the beginning of the dial phone era, which was before my time, but it'd be just as helpful if someone like, oh, let's say my kids, were faced with one of the ancient contraptions. Yeah, it's a familiar lament. I don't think my 23-year-old girls have ever used a record player either, even though we've always had one in the living room (it was the first thing Karen and I bought together, now hidden inside the cabinet of an antique hand-cranked phonograph, an irony I always appreciated). No message besides the obvious. I try to watch the parade of time and my cyclic obsolesence with easy-going bemusement, because the alternative hurts. "Now children, gather round and I'll tell you what it was like growing up watching black-and-white TV with three channels!" Ooh! Better record my stories and put them in the Smithsonian now, while I can still remember them. "Here now, son, let me show you how to operate that Walkman before you hurt yourself." Thanks, old man! "See this dusty thing here, with all these sheets of paper stuck in it? It's called a book." I'm actually surprised and happy with how this turned out. First, I shot it with a simple little digital point-and-shoot in video mode, nothing sophisticated. Second, I did a dry run with a different camera (a Flip) during a very short ISS pass last night that failed utterly. Third, it wasn't long after sunset and the sky was still quite bright and hazy; I wasn't sure we'd see anything. All things considered, I'm very pleased. The ISS didn't really look much different from an airplane, and you kind of have to think about what you're looking at for the impact to hit you. There are people on that thing. In space. People in space. 200 miles high. In space. In the five minutes it took me to walk home after shooting this, they'd already traveled halfway across North America. So: impressive! As I mentioned before, the website Heavens Above can give you a list of all the times the ISS is visible from your house for the next 10 days. I think it's worthwhile to take 5 minutes to go outside, look up, and marvel. Yoe, Kids, it's 3-D Comics! 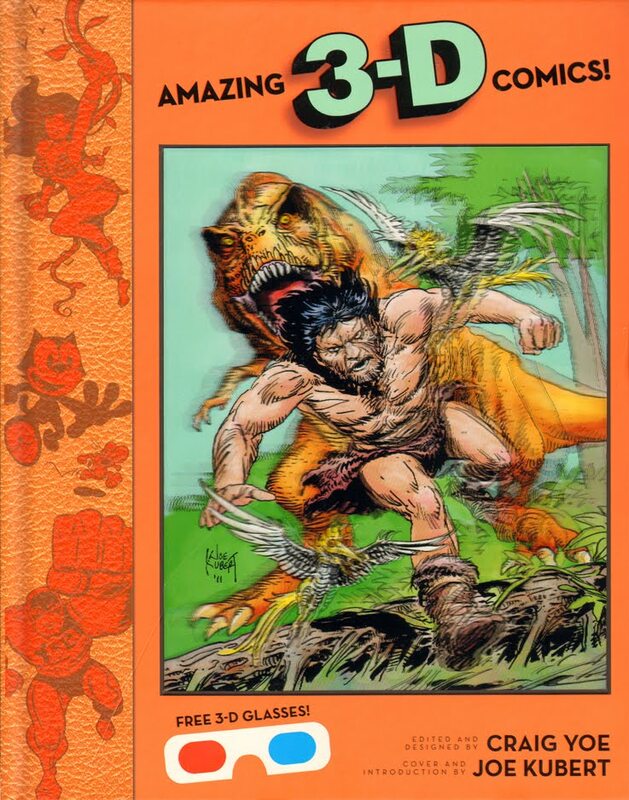 Just arrived in my mailbox is the new book Amazing 3-D Comics, edited and designed by Craig Yoe with a cover and introduction by the great comic book artist Joe Kubert. What a terrific book: a joyful, energetic, thoughtful celebration of the red-blue 3-D comics of the early 1950s, with both Kubert (who helped invent them) and Yoe providing historical context and technical insights into the process, along with pages and pages of actual 3-D comics carefully remastered by Yoe. Incidentally, that link above goes to an Amazon page with a cover image that looks nothing like the actual cover. In fact, I couldn't find a decent image of the real one online and had to scan my own, which I think had the accidental benefit of capturing some of the 3-D quality of Kubert's beautiful lenticular cover image, one of the nicest I've seen. I know Craig Yoe through Editor Charlie (Craig has done books for Abrams, including a great one on the comic strip Krazy Kat and its creator George Herriman) and I've never met anyone with more passion and appreciation for old comics, the more obscure the better. He's a writer, designer, publisher, creative director, historian, and unique character (I don't think he'd mind me saying that) who recently gave me a ton of free advice for Mystery Project X that I appreciated very, very much. He also told me how much care went into printing Amazing 3-D Comics, including the use of two extra Pantone inks (not cheap) in addition to the usual cyan, magenta, yellow and black, to try to present these comics in their best light. In my opinion, Craig's hard work and attention to detail paid off. I thought Amazing 3-D Comics was a beautifully designed book that perfectly balanced information and entertainment, curated by two of the most qualified people on the planet. I read it with a smile and enjoyed it a lot. I couldn't find a photo of Craig Yoe with me, so here's one I took of him with Editor Charlie instead. Craig's the one with superior taste in shirts. Attention West Coast Space Rangers! This Friday, August 12, shortly after 8:30 p.m., the International Space Station will be flying over your town! The ISS is always flying over somebody's town, and can cover a given area several times per week. In fact, this week and next offer my part of the planet several opportunities to see the ISS just before dawn or after dusk, when the sky is darkish and the station reflects the light of the Sun just over the horizon. What makes this apparition special enough to trigger the Space Patrol Orange Alert is that the ISS will be passing very close to the Moon, which'll make it easy to find and could give someone a nice photo op. In fact, it looks to me like observers along a line running from Watsonville (Calif.) through Turlock to approximately Battle Mountain (Nevada) have a good chance to catch the station flying across the face of the Moon, which would be very cool indeed. The website Heavens Above can provide times and sky charts for your area. The map at the top of this post is for San Francisco, and shows the ISS skimming just under the Moon. Tell the site where you live--either by entering latitude and longitude, searching for your city's name, or pinpointing it on a map (if you use the map, don't forget to also specify your Time Zone)--then pick "10 Day Predictions for: ISS," and it'll provide a list of all your viewing opportunities. This one is for 12 Aug starting around (depending on your location) 20:33. So, Space Rangers stationed in California, Nevada, Utah, Arizona and northern Mexico: go outside this Friday night around 8:30 and watch the southern skies to the right of the Moon. The ISS should look like a pretty bright star moving at a fair clip from right to left. The farther south you're located, the higher in the sky it'll appear. You don't need a telescope, although some people have seen the station's distinctive H-shape through binoculars. If you haven't spotted anything by 8:40, you missed it. Better luck next time! Don't forget to report your findings to Cap Crater at Space Command, and ad astra per aspera! 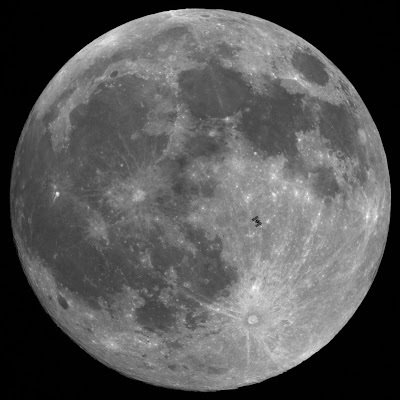 Astrophotographer Theirry Legault took this shot of the ISS transiting the Moon last December. Think you can do better? Give it a try! Not everyone will appreciate today's topic, but a very small number of the right people are going to lose at least an hour of their day and thank me for it. "Forty Acres" was the nickname of a 29-acre (I know) movie studio backlot in Culver City, California active from the days of silent films into the '70s. It provided facades for western towns, small towns and downtowns. At various times it housed Tara from "Gone With the Wind," Stalag 13 from "Hogan's Heroes," King Kong's giant gate and Tarzan's jungle. The lot got its greatest sustained exposure as Mayberry over several years of "The Andy Griffith Show." Demonstrating precisely why the Internet was created, many courageously dedicated souls--some clearly cursed with OCD--have combed through pretty much every television program and movie made during those decades to produce a meticulously cross-referenced visual catalog of Forty Acres. Want to see how the same street looked in "Superman," "The Andy Griffith Show," "Star Trek," "The Untouchables," "Land of the Giants," "Lassie" and "Batman"? These guys can help you with that. 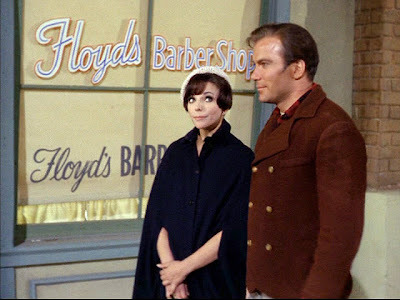 I've seen the "Star Trek" episode "City on the Edge of Forever" a thousand times but never really tumbled to the fact Captain Kirk and Edith Keeler stroll past THE Floyd's Barber Shop from Mayberry. 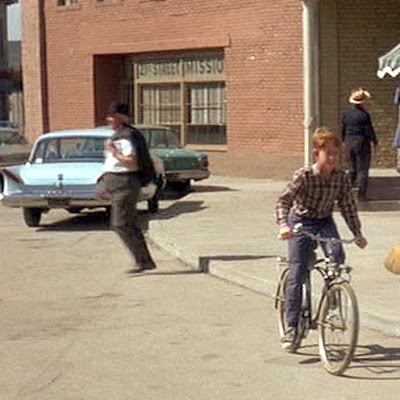 Fair turnabout: in "The Andy Griffith Show" Opie rode his bicycle past the 21st Street Mission (note the sign in the window) where Kirk and Spock found a hot meal and the tools needed to build a computer during the Depression. It's all at the Forty Acres website. If you grew up watching TV and films from this era, these streets may seem like old familiar friends to you. It took me a minute to get the hang of navigating the site; use the tabs at the top to select topics. Clicking on most photos magnifies them. It all interesting--like I said, for some tiny proportion of the population (I'm looking at you, Lynch and O'Kane)--but I thought the real gold was in the four-part "Virtual Tour." I dunno. Maybe I'm not hooked up right. When our girls were 16, Karen and I took them on our first (and to date only) family trip to Europe, cruising around the Mediterranean. Very near the top of my list of most delightful discoveries was the National Museum of Monaco, which we stumbled upon just wandering around the city-state after forgoing the organized tours. We figured, "It's a museum, the price is OK . . . ehh, let's take a look." It turned out to be entirely dedicated to old dolls and automatons--ingenious wind-up robots built in the Eighteenth and Nineteenth Centuries. My girls and I approaching the Museum. We had the place almost to ourselves and had just started up a staircase when a docent came rushing down, herding us with his arms and commanding us in rapid-fire French (which none of us understand) to turn around and descend. We wondered if we'd done something wrong and were being thrown out. But it turned out we'd arrived just in time for the tour, and our guide took us from display to display, wound them up, and stood back to watch our amazement. The automatons had the most incredible life-like action. Graceful, delicate, even poignant. Some of them breathed. One of the things that interests and amuses me about history in general, and the history of science and technology in particular, is the subconscious arrogance most of us carry around. We seem to think we're smarter than all the generations that came before us. We're not. To paraphrase Newton, if we see farther, it's only because we're standing on their shoulders. Never, ever underestimate the ingenuity of a person in any century trying to solve a problem or make something work. Look at what skilled craftsmen could accomplish with gears and springs (and without electricity) two centuries ago! Except for occasional telepathy, my girls have never exploited their identical-twinness--no dressing the same, no swapping classes, no fooling their friends. The whole "twin thing" is a low-level buzz in the back of their lives that Laura and Robin tolerate when they have to. This summer they're both on the "Special Events" staff of our County Fair. Usually that means minding the children's game area, working the Information Booth, or running whatever errands need running. 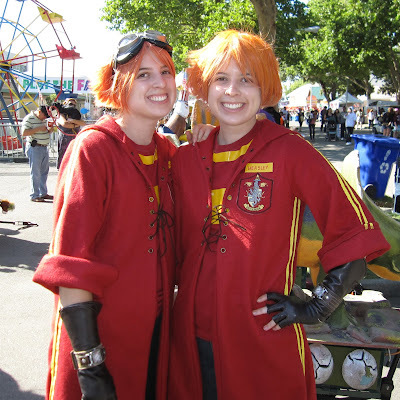 This year, their boss Jane declared Sunday to be "Harry Potter Day" at the Fair, with specially themed decorations and contests, and encouraged her employees to get into the spirit. Meet Fred and George Weasley. Or George and Fred. I never could tell them apart. Posted with their reluctant permission (thanks, girls!). The highlight of my day was when a woman asked me, "Are you the Weasley twins' dad?" Yes. Yes, I am Mr. Weasley. Just here studying the muggles for the afternoon. Carry on. Only kidding about the telepathy. I think.